DEARBORN, Mich.—Author and researcher Alison Weir’s latest book, Against Our Better Judgment: The Hidden History of How the U.S. Was Used to Create Israel, outlines the hard financial, political and moral realities of United States foreign aid to Israel. To highlight the important information in the book, she spoke on July 1 in Dearborn, Michigan to a crowd of some 200 attendees. She spoke the prior evening in Ann Arbor, Michigan at a public library. In this video taken at a park in busy downtown Dearborn, which captured most of her speech, Ms. Weir covers the essential disturbing facts that far too many Americans don’t know about the U.S. relationship with Israel. This is why Ms. Weir named her research organization “If Americans Knew.” Under the umbrella of that outfit, she wrote the above-noted book and has published numerous studies that provide shocking financial data—which mainstream media refuse to report. Ms. Weir was well-received in Dearborn, a heavily Muslim community just outside of Detroit where many people of Palestinian origin reside. 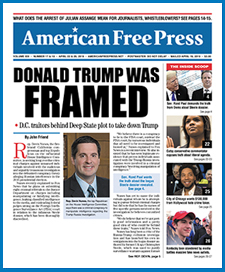 AMERICAN FREE PRESS was the only media of any kind to attend. No matter what your “take” is on this subject, watch the video and decide for yourself if U.S. foreign aid to Israel is justified. Her message applies to those already “in the know” about this matter as well as to those who aren’t informed about it.